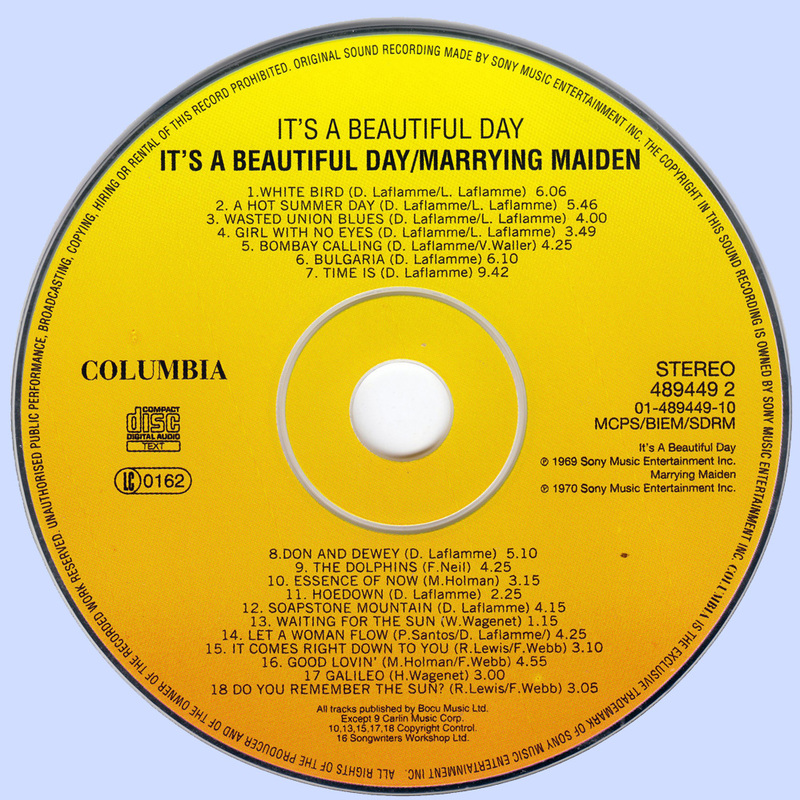 It's a Beautiful Day were no less memorable for their unique progressive rock style that contrasted well with the Bay Area psychedelic scene. Led by David LaFlamme (flute/violin/vocals) and his wife, Linda LaFlamme (keyboards), the six-piece unit on this album vacillates between light and ethereal pieces such as the lead-off cut, "White Bird," to the heavier, prog rock-influenced "Bombay Calling." 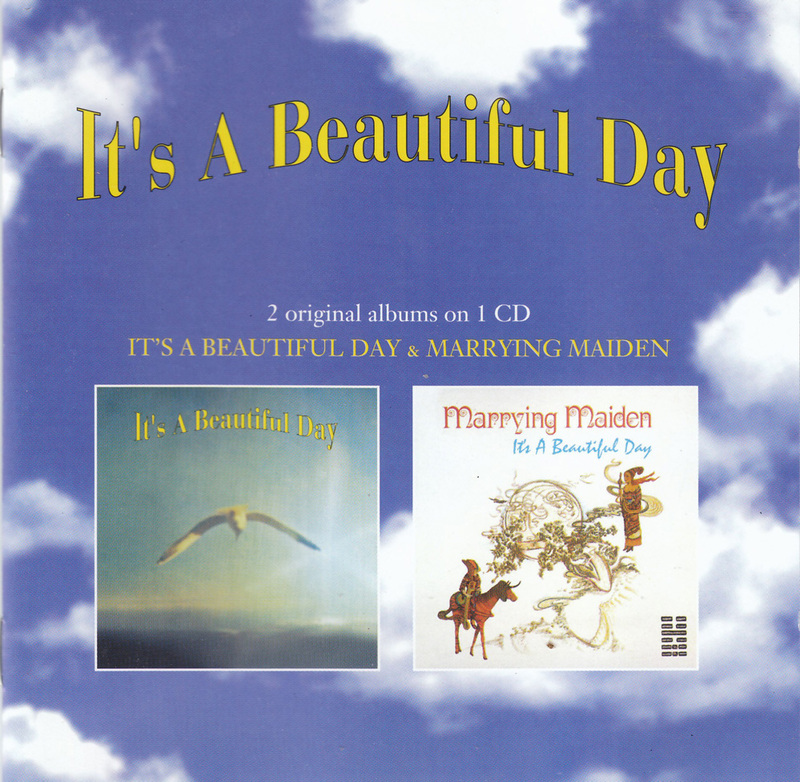 One of the most distinct characteristics of It's a Beautiful Day is their instrumentation. The prominence of David LaFlamme -- former violin soloist with the Utah Symphony and original member of Dan Hicks & His Hot Licks -- adds a refinement to It's a Beautiful Day's sound. Likewise, the intricate melodies -- mostly composed by the LaFlammes -- are structured around the band's immense virtuosity, a prime example being the exquisitely haunting harpsichord-driven "Girl With No Eyes." The noir framework, as well as lyrics such as "...she's just a reflection of all of the time I've been high," point rather candidly to the hallucinogenic nature of the song's -- if not the band's -- influences. The same can be said of the languidly eerie "Bulgaria." The almost chant-like quality of the track slowly crescendos into an hypnotic and dreamlike sonic journey -- led by LaFlamme's brilliant violin work. By virtue of being a Bay Area fixture in the late '60s, It's a Beautiful Day could also easily double as a hippie dance band -- which they can also execute with great aplomb -- as the wildly up-tempo "Time Is" amply proves. It's a Beautiful Day remains as a timepiece and evidence of how sophisticated rock & roll had become in the fertile environs of the San Francisco music scene. The second long-player from It's a Beautiful Day is an exceedingly more pastoral effort than the band's self-titled debut. As many of the Bay Area groups -- most notably the Grateful Dead with Workingman's Dead and American Beauty -- had begun to do, the band realigns its sound from the dark psychedelia and proto-prog of its earlier works and into a lighter and earthier country-flavored rock. 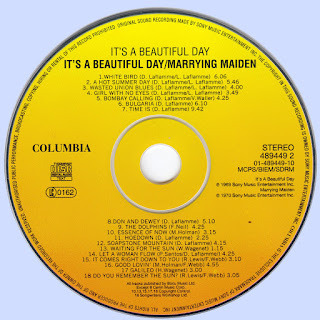 Marrying Maiden does, however, continue highlighting both the sextet's stellar instrumental proficiencies as well as vocals -- featuring the entire band -- throughout. "Don and Dewey," the album's opener, is a hot-steppin' spotlight for David LaFlamme's classically trained violin work. Presumably, the tune is an ode to the late-'50s/early-'60s R&B duo of the same name. The track has distinct hints of the concurrent contributions that LaFlamme had been making in an incipient incarnation of Dan Hick & His Hot Licks. It likewise sets the tenor for the remainder of the disc's down-home feel. The cover of folkie Fred Neil's "The Dolphins" is notable for Fred Webb's honky tonk piano fills and LaFlamme's vocals, recalling some of the earliest New Riders of the Purple Sage sides. One of the more solidly unifying factors linking the NRPS and It's a Beautiful Day is the guest appearance by Jerry Garcia, who is featured on two numbers. As he had done on Crosby, Stills, Nash & Young's "Teach Your Children," Garcia lends a few distinct pedal steel guitar riffs to the perky "It Comes Right Down to You." The track also features former Charlatan Richard Olsen on, of all things, clarinet. Another sign of the times is the pickin' and grinnin' on the appropriately titled "Hoedown" -- on which Garcia adds some fiery banjo fretwork. All songs by David LaFlamme except where indicated.